Establishing Excellence: Where Do We Go from Here? The chapter explores the pedagogical basis of establishing excellence in educational practice. This is achieved by: exploring what excellence means and its relevance to higher educational practice; applying excellence to pedagogical approaches in particular (heutagogy) and offering ways of how to measure and demonstrate excellence within the curriculum. 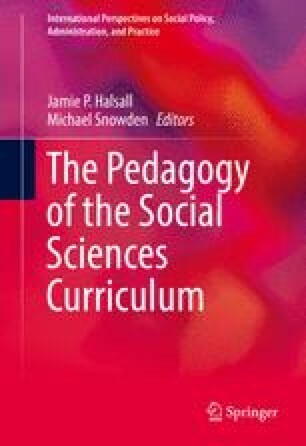 The chapter is based on a workshop presentation delivered at the HEA York, UK, in March 2014 entitled ‘Excellence within the curriculum a lesson from EPAS’ at a Higher Education Academy (HEA) sponsored event exploring ‘Community Development and Engagement’. Bell, D. (2010). Marketing Department Wharton University of Pennsylvania. http://marketing.wharton.upenn.edu/people/faculty.cfm?id=227#pp. Accessed 5 Nov 2015. Burford. L. (2011). My journey his purpose: thoughts on faith, community and leadership. http://www.leebuford.com/on-defining-excellence/. Accessed 5 Nov 2015. Deming’s 14 Points on Total Quality Management (2015). http://asq.org/learn-about-quality/total-quality-management/overview/deming-points.html. Accessed 10 Nov 2015. Department for Business Education and Skills (2015). Fulfilling our potential: teaching excellence, social mobility and student choice. Higher Education Directorate, Department for Business, Innovation and Skills, London. https://www.gov.uk/government/consultations/higher-education-teaching-excellence-social-mobility-and-student-choice. Accessed 10 Nov 2015. Department of Health (2011). Equity and excellence: liberating the NHS. Department of Health, London. https://www.gov.uk/government/uploads/system/uploads/attachment_data/file/213823/dh_117794.pdf. Accessed 5 Nov 2015. Green, H. (2012). Redefining excellence for today’s World. http://www.forbes.com/sites/work-in-progress/2012/03/06/redefining-excellence-for-todays-world/. Accessed 10 Nov 2015. Higher Education Academy (2015). The HEA’s Teaching Excellence Programme (TEP) HEA. https://www.heacademy.ac.uk/recognition-accreditation/professional-development-courses/hea%E2%80%99s-teaching-excellence-programme-tep. Accessed 10 Nov 2015. Kok, K.S., McDonald, C. (2015). Underpinning excellence in higher education—an investigation into the leadership, governance and management behaviours of high performing academic department studies in higher education. http://www.tandfonline.com/doi/full/10.1080/03075079.2015.1036849. Accessed 10 Nov 2015. Mroz, A. (2010). Leader: as one in search of excellence. Times Higher Education. https://www.timeshighereducation.com/comment/leader/leader-as-one-in-search-of-excellence/412284.article. Accessed 10 Nov 2015. Oxford Dictionary (2015). ‘Excellence’ Oxford Dictionaries. http://www.oxforddictionaries.com/definition/english/excellence. Accessed 10 Nov 2015. Quality Assurance Agency (2014). The United Kingdom (UK) Quality Code for Higher Education, QAA. http://www.qaa.ac.uk/publications/information-andguidance/publication?PubID=181#.VkH2qklFAdU. Accessed 10 Nov 2015. The EFQM Excellence Model (2015). http://www.efqm.org/. Accessed 10 Nov 2015. The Excellence Practice Accreditation Scheme (EPAS) School of Health and Social Care, Teesside University, Middlesbrough, https://www.tees.ac.uk/schools/soh/epas_index.cfm. Accessed 10 Nov 2015. The Toyota Production System 4P (2015). http://missiontps.blogspot.co.uk/p/starting-point-of-tps.html. Accessed 10 Nov 2015.